A James Cook University scientist has discovered why there was an unprecedented dieback of mangroves in the Gulf of Carpentaria in early 2016 - the plants died of thirst. Dr Norman Duke, leader of JCU's Mangrove Research hub, headed an investigation into the massive mangrove dieback. The findings were published in the Journal of Marine and Freshwater Research today. The scientists used aerial observations and satellite mapping data of the area dating back to 1972, combined with weather and climate records. 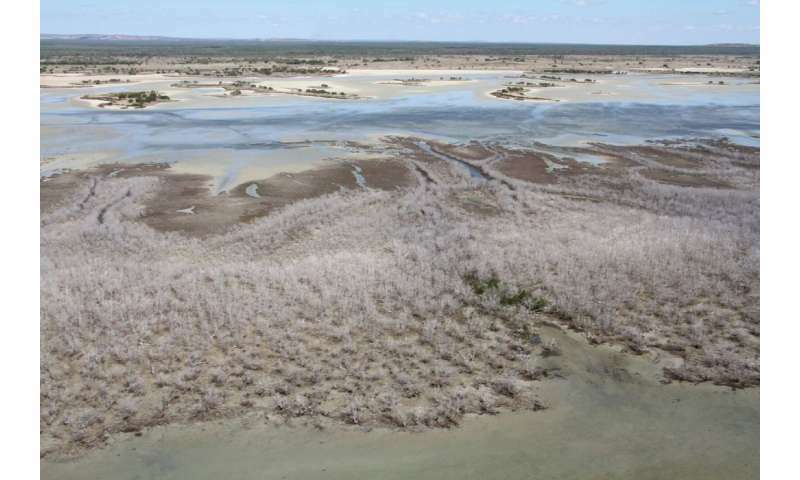 Dr Duke said they found three factors came together to produce the unprecedented dieback of 7400 hectares of mangroves, which stretched for 1000 kilometres along the Gulf coast. "From 2011 the coastline had experienced below-average rainfalls, and the 2015/16 drought was particularly severe. Secondly the temperatures in the area were at record levels and thirdly some mangroves were left high and dry as the sea level dropped about 20cm during a particularly strong El Nino." Dr Duke says this was enough to produce what scientists regard as the largest recorded incident of its kind, and the worst instance of likely climate-related dieback of mangroves ever reported. "Essentially, they died of thirst," he said. Dr Duke said scientists now know that mangroves, like coral reefs, are vulnerable to changes in climate and extreme weather events. He said the mangroves of Australia's Gulf region have experienced relatively little anthropogenic impact and are considered the least altered mangrove ecosystems in the world. "So the relative dominance of climate influences in this region is of critical interest to world observers of environmental responses to climate change." Dr Duke said the area is sparsely populated, with passing fisherman and scientists conducting unrelated work the first to notice the dieback. "It took 4-5 months to come to the attention of mangrove tidal wetland specialists and managers. Our response to this event further involves training and equipping Indigenous rangers and local community volunteers to build local partnerships for rigorous and repeated shoreline assessments." "We cannot afford to be caught out like this again!" said Dr Duke. "The Gulf dieback has been a wakeup call for action on shoreline monitoring. We urgently need a national shoreline monitoring program commensurate with our global standing. We have the specialists, we have the resources, and we know there is interest and concern amongst the Australian public." To progress this further, Australia's top specialists and managers will review the situation at a dedicated workshop during next week's Australian Mangrove and Saltmarsh Network annual conference in Hobart, hosted by the University of Tasmania and CSIRO. "The aim of Australia's specialist network is to apply intelligent, innovative and considered responses, as fully expected by the public, to improve and disseminate informed understandings of the changes taking place in high value natural resources such as Australia's coastal tidal wetland habitats," Dr Duke said.